This is a thought-provoking book that solicits the question: is this the record of the demise of a branch of medicine that was once held in great esteem? The essence of a good book is that it produces new observations and findings rather than just regurgitates the writings of others. Achieving this entails original research using archive documents, field work, archaeology, etc. Roger Rolls' new book achieves this and thus extends the scope of our understanding of the application of thermal waters for health, particularly at Britain's unique thermal spa Bath. The book is fully referenced and indexed and contains 245 printed pages with soft covers. The size is 16.4 cms. x 24.5 cms. It is profusely illustrated, with many pictures in full colour. Dr. Roger Rolls, as a medical historian, was particularly active during the 1990s with the British Spas Federation, promoting well-being through the application of spa waters. This era was decisive for the spa industry, laying the foundation for the 21st century spa revival in the UK. Today we can see how the industry has evolved and Roger Rolls leaves the reader thinking that an opportunity has been missed. 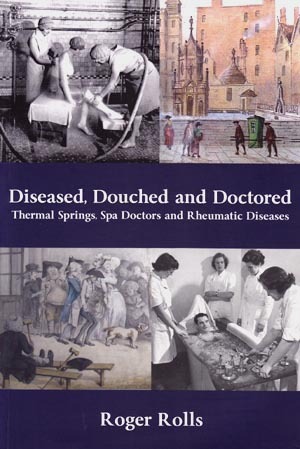 Diseased, Douched and Doctors traces the utilisation of thermal spring waters for healing since the Romans, concentrating on the 17th to 19th century period when spas as a branch of medicine were in their heyday. It focuses on the waters of Bath, which are unique in the UK. It also touches on the tepid waters of Buxton, Matlock and Bristol. Detailed examples are given of the wide variety of treatments on offer over the centuries and their effects. This is of special interest to anyone wishing to investigate the former merits of spa treatments in medicine and also the problems, such as contamination of communal bathing waters by the sick. Of particular interest are the historic pictures of people showing physical symptoms such as limp limbs and swollen joints. The changing fashion for different treatments is apparent, particularly as new technologies become available such as electricity. The case is cited of the pioneering use of electricity for healing at Worcester Cathedral in the 18th century. 'Perhaps it was the ethereal quality of electricity which rendered it attractive to ministers of religion' . (page 47) Such practices were readily integrated into the range of treatments available for 'the cure' at Bath's healing water establishments. In spite of enthusiasm for new gadgets, important research opportunities were missed. The Bath Mineral Water Hospital was noted for its treatment of rheumatism, one of the long lasting conditions that had defied the other two main areas of medicine historically, the surgeon's knife and drugs. In spite of the high number of patients, little innovation was apparent over the years at Bath, leaving the way open for the other alternatives to develop effective treatments. Prevention also challenged Bath's cure regimes. Lead poisoning was effectively treated at Bath up to the 19th century. However recognition as to its causations eliminated much of the problem and the Bath water cure became obsolete. When reading the book and comparing England with European spas where medical treatments are still practiced, one can not help wondering if we have missed an opportunity for mineral water cure development, especially as it is less invasive than drugs or less irreversible than the knife? In England the sun is setting on spa waters as a serious branch of orthodox medicine. Even the Thermae Bath Spa, opened in 2006, concentrates on leisure and pleasure experiences, leaving the cure to mainstream medicine via the National Health Service. For anyone interested in the history of medicine or the use of source waters, this book is a must that will extend their understanding of the history and development of a branch of medicine that has all but disappeared in England. Available from the publishers at £19.99. Amazon list this book should you wish to purchase a copy.